The Falcons were firing on all cylinders Friday night as they beat the Northwest Mohawks 55-7 in McDermott. The Mohawks defense started off the game well as they stopped the Falcons on a fourth down conversion. However, things would quickly turn for the worse for Northwest on the night as the Falcons were soon off and running effectively and efficiently. Minford running back Elijah Voglesong would be the first Falcon to put points on the board as he ran it in from 46 yards out to give Minford the lead, 7-0. After forcing a Mohawks three and out, Minford quarterback Kelton Kelley would connect on a 40 yard touchdown pass to Voglesong to put the Falcons up 14-0 with 4:46 left in the first. Kelley would throw for 60 yards on the night to go along with his long touchdown pass. Minford running back Ty Wiget would have a huge game on the ground as he was the next Falcon to put the ball in the end zone on a big 27 yard touchdown run, putting Minford ahead 21-0. Wiget continued to be a force on the ground as he added another touchdown in the second quarter. Wiget would tally 152 yards on the ground Friday night to go along with two scores. Voglesong would score again in the first half, this time on the ground to extend the Falcons lead to 35-0. The Mohawks would get on the board for the first time midway through the second quarter as quarterback Austin Newman would connect on a 23 yard touchdown pass to Ashton Hall for Northwest’s only score of the night. 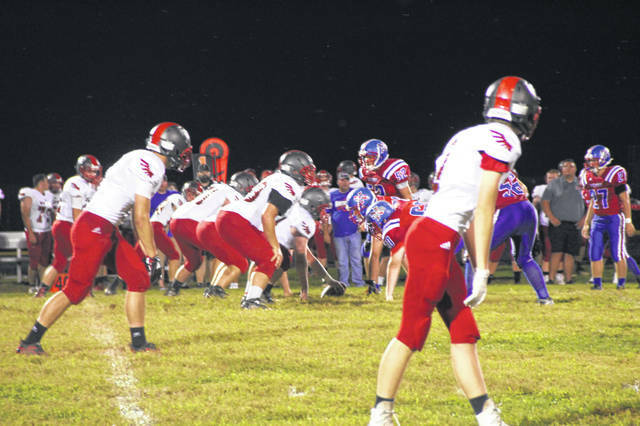 Minford will hope to keep their hot start going next week in a road trip to Williamsburg. Northwest will open their season of SOC I play next week at home against the Eastern Eagles.